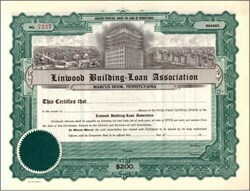 Beautifully engraved unissued certificate from the Linwood Building = Loan Association printed in 1933. This historic document has an ornate border around it with a vignette of a city skyline with a building being built. This certificate is over 75 years old.